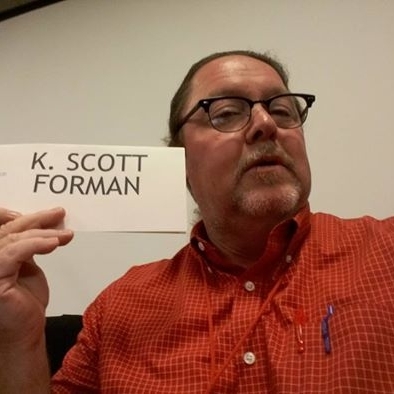 K. Scott Forman is a writer and editor. He co-edited and contributed to the first three volumes of Fast Forward: A Collection of Flash Fiction along with working on three more volumes, a novel, and a flash novel for the now "on hiatus" Fast Forward Press. He received a Master of Fine Arts degree in Creative Writing from the Jack Kerouac School of Disembodied Poetics at Naropa University, and was the recipient of the Robert Creeley Scholarship in 2007. He also received a Master of Arts and Education degree from the University of Phoenix and a Bachelor of Arts in English and Middle Eastern Studies from the University of Maryland. Scott teaches English Composition at Weber State University, and has also taught courses in Developmental English, Research, Writing for Math and Science, and Haiku. He is a member of the Horror Writers Association (HWA) and enjoys long walks, sunsets with blood in them, and Metallica at volumes determined unsafe by the Surgeon General. He has had several short stories and poems published and hopes the Great American Novel is just around the next bend. He resides in the Rocky Mountains with his family and a collection of guitars.